The founders of Lioness Martial Arts are experienced martial artists who specialize in empowerment self-defense and personal safety instruction. Susan M. Dunn holds the rank of Sixth Degree Black Belt, and is the chief instructor at Lioness Martial Arts. She is an experienced speaker and has made numerous public appearances as an assault prevention expert and karate practitioner. 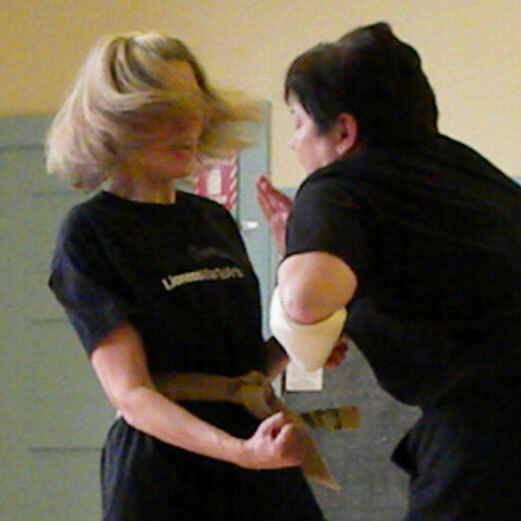 Mona MacDonald holds the rank of First Degree Black Belt and is an NWMAF Certified Self-Defense Instructor. The instructors were trained in Shorin-Ryu karate by noted Eighth Degree Black Belt, Kyoshi Bobbi Snyder. The partners have been teaching self-defense and karate for over 25 years, at Lioness Martial Arts and prior to that, in Kyoshi Snyder’s school in Pittsburgh, PA.
Dunn and MacDonald are active members of the National Women's Martial Arts Federation and the Association of Women Martial Arts Instructors. They both have completed the Self-Defense Teacher Certification Program sanctioned by the International Karate Kobudo Federation. Please contact us for more information, or to schedule a class.